Combining hundreds of years of islamic traditional architecture, without losing a drop of history and with extreme attention given to materials and details – is just the kind of approach we are used to see from Lord Norman Foster. The building is designed to produce 60% more energy than it consumes, meaning that the remaining energy is directed towards the Abu Dhabi grid. 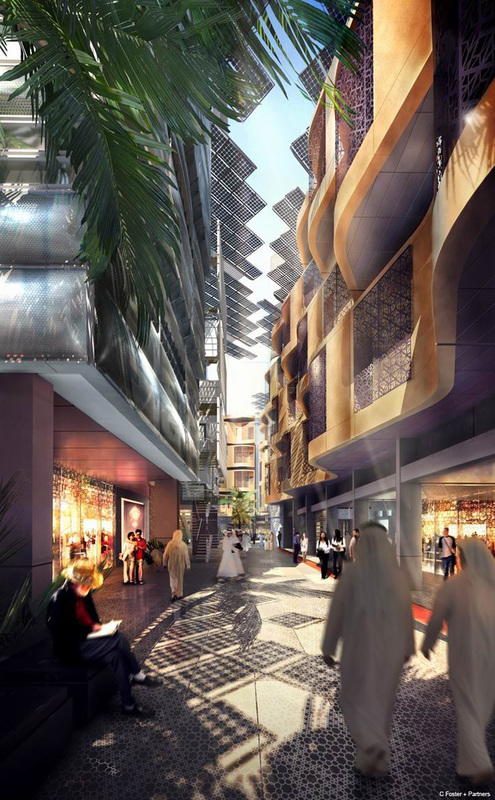 It’s main destination is to be the first in an Abu Dhabi international center for pioneering sustainable energy. The campus building, destined to bring together 600 to 800 students, will aventualy include residential buildings, a laboratory, a mosque , a conference hall and sports complex. The official inauguration of the first of four self sustainable buildings at The Masdar institute was attended by His Highness Sheikh Mohammed bin Zayed Al Nahyan, Crown Prince of Abu Dhabi and Deputy Supreme Commander of the UAE Armed Forces, His Highness Sheikh Mansour bin Zayed Al Nahyan, Deputy Prime Minister and Minister of Presidential Affairs. • The Masdar Institute’s graduate-level programmes were established and accredited in collaboration with the Massachusetts Institute of Technology (MIT) in Boston and focus on scientific engineering and research in the core energy and sustainable technologies of the Masdar Initiative. • The buildings are oriented to provide optimum shade and reduce cooling loads and shaded colonnades at podium level bring benefits through high insulation and exposed thermal mass. Transitional thermal spaces are also integrated – these mediate between internal and external zones and are conditioned primarily by buoyancy-driven natural ventilation and the effects of thermal mass. • The ventilation strategy for the pedestrian streets and night time cooling is further enhanced by wind towers and courtyards. Pedestrian circulation is mostly at street level, where a shaded route throughout the campus links these primary spaces. • The green linear park adjacent to part of the buildings captures cooling night-time winds, while wind gates control hot winds. The public spaces within the development are designed as lively social hubs, naturally cooled by shading, green planting and a small number of water features, to mitigate the effects of the intense local climate. • The ratio of open facades is varied between shaded lower areas and exposed upper areas. Openings in the façade vary according to their position – the upper floors are more solid, with approximately 25 percent glass, while the shaded lower floors have a greater proportion of glazed area, around 45 percent. • The laboratory facades incorporate ETFE, inflatable cushions made of a lightweight polymer, and have been designed to filter and reflect light into the street, without radiating heat. • The laboratories – and an interactive laboratory space – are at the heart of the development and are designed to offer the largest flexible, column free space possible within the strict loading and vibration criteria. Support facilities are arranged in a functionally efficient, linear layout adjacent to the open laboratories and a central café creates an informal space for researchers and staff to meet. All sewage is processed on site and recycled. • Mashrabiya is the Arabic term given to a type of projecting oriel window which was traditionally enclosed with carved wood latticework. Referencing traditional Arabic architecture, it is used primarily on the street-facing aspect of the building.